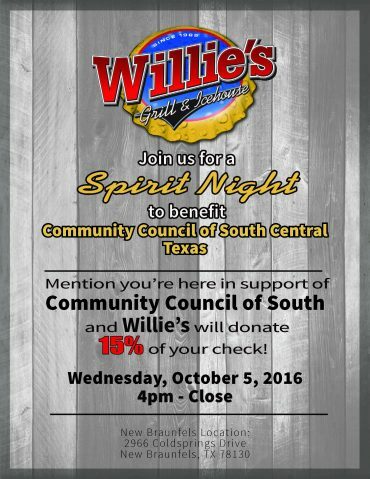 CCSCT has partnered with Willie’s Grill & Icehouse in New Braunfels and will be holding a Spirit Night, which will be held on Wednesday, October 5th, from 4pm to close. To show your support, come out and mention that you are there to support Community Council of South Central Texas and 15% of your check will be donated directly to CCSCT. CCSCT is dedicated to empowering low-income families and individuals in South Central Texas by helping them transition out of poverty and become self-sufficient. The organization does this by providing comprehensive health, nutrition and social service programs that support families and individuals throughout the transition period.